Over Christmas, 41-year-old Dublin restaurateur Shane Mitchell was sitting around a pub table, catching up with friends over a couple of festive pints. It took him a while before he noticed there was one ingredient missing in the social occasion - food. "We ended up having six or seven pints," he said. "So I looked around and asked my friends, 'Can anyone remember the last time we did this?' No one could. "When I was socialising in my mid-20s, I'd never say to pals, 'Let's meet for dinner and then go out'. Food was just for soakage." Sessions in the pub, once the linchpin of an Irish social life, have long been on the decline, with alcohol consumption plummeting by 25pc between 2005 and 2017, according to the World Health Organisation. Millennials and Generation Z (the latter is typically categorised as the demographic born after 1995) are especially eschewing the pub and club blow-outs embraced by previous generations, more mindful of its effects on their waistline, physical health and mental well-being. Instead, they are socialising at restaurants, where the focus is more on Instagrammable food trends and decor than knocking back pints. Hot pizza slice with melted mozzarella cheese and tomato on black concrete background. Pizza Ready to Eat, Copyspace. "Generation Z and millennials are drinking alcohol, in the form of gin and spirits cocktails, but are drinking less of it," said Mitchell, who owns Asador, a high-end restaurant on Haddington Road in Ballsbridge that serves Mediterranean-style barbecued meat and fish. "They are more interested in body image than we used to be, are more conscious of calories, go the gym more and are better-travelled. "As a result, the lines between restaurants and bars are becoming blurred. Food is a big part of what pubs are doing now. So restaurants are becoming more 'pubby' and pubs are becoming restaurants." Urban-based millennials pick where to eat from Instagram feeds and Snapchat stories and congregate at the newest restaurants. Indeed, Niall Delmar, associate director of retail at JLL, says "a lot of operators that are opening even hire Snapchat stars and influencers to push the brand". Bord Bia has estimated consumer spending at Ireland's 2,500 full-service restaurants grew 6.3pc to €229m in 2018. Adrian Cummins, chief executive of the Restaurant Association of Ireland, says the number of new restaurants opening rose 15pc over the last 18 months. In Dublin, food critics barely have time to rest their forks as they dash from one new restaurant to the next. With Ireland experiencing the fastest economic growth of any eurozone country since 2014, it was no great surprise that The Ivy Collection chose Dublin as the location for its first international brasserie. The Dublin incarnation of the London celebrity hangout opened on Dawson Street in July. When the 85-seater Shelbourne Social opened in December at the One Ballsbridge development, after a reported investment of €3m, it hit the headlines for selling €120 steaks. Shelbourne Social was the sixth venture for celebrity chef Dylan McGrath and his business partner and backer Vincent Melinn. The same month, Paddy McKillen Jr's Press Up Entertainment Group opened Isabelle's on South Anne Street, cladding its walls with art curated by IMMA and the Kerlin Gallery. Its menu includes a cocktail list with low-alcohol drinks for millennials. The latter cohort are a "core audience group" that account for "a large proportion of our customer base", said Laura Arnold, Press Up's head of marketing and PR. The chain has "witnessed the rise of social occasions being centred around food, and food-led experiences, rather than solely around alcohol. Consumers are making a conscious decision to drink less, or differently, with options like no-alcohol and low-alcohol drinks becoming more popular, and a focus on quality over quantity." While millennials and Gen Z'ers are spending their disposable income in restaurants decked out with ubiquitous mid-century booths with soft tan leather or velvet upholstery, glass bars heaving with premium gin, and vintage-style light fixtures, the death knell is sounding for the super-clubs and pubs once frequented in the 1990s and early noughties by Generation X, now aged around 39 to 54. January saw the closure of both Lillie's Bordello and one of Dublin's biggest nightclubs, the Wright Venue, which will be transformed into Jam Park, a games, dining and events space. In the run-up to the St Patrick's bank holiday, it was revealed that the founders of Copper Face Jacks were putting the Harcourt Street club and the adjoining Jackson Court Hotel on the market, where it's expected to fetch at least €40m. Meanwhile, the Mercantile Group, the owner of bars like Whelan's and restaurants Opium and Pichet, spent an estimated €4m on revamping Cafe en Seine, the super-pub that epitomised the Celtic Tiger era, into a bar with a dedicated restaurant area. As a result of changing consumer habits, Cummins believes Ireland will experience "the obliteration of the nightclub scene over the next two years". "The restaurant is the now to go-to place for socialising for millennials and all parts of Irish society," he said. But the benefits of the urban restaurant boom are far from evenly spread, with well-financed restaurant groups swallowing up prime locations, pushing independent operators to the suburbs in search of cheaper rents and market share. Expansion of restaurant chains means the slice of the pie is shrinking for independent restaurants, whose already-tight margins are being squeezed even further by the doubling of the Vat rate in January, rising property costs and uncertainty over Brexit. These pressures, combined with growth in urban markets being inhibited by the number of city-centre outlets reaching near-saturation point, means Ireland's foodservice sector, which includes pubs, will increase by 4.7pc between now and 2020, compared to growth of 6.1pc last year, Bord Bia said. Press Up, the country's largest and fastest-growing bar and restaurant group, doesn't believe the market is reaching its limit for eateries. However "this is not to say that it's not a concern moving forward, and will be factor considered in future business choices", said Arnold. "Within the next two years, Press Up will have opened The Dean Galway and The Dean Cork. Both hotels will have a strong food and beverage offering." Its 40 hospitality businesses include The Dean Dublin, a hotel with a rooftop restaurant called Sophie's and the Grayson on St Stephen's Green. Its parent company posted a 14-fold rise in pre-tax profit and revenue of €57.9m in 2017, when it opened eight new venues. Maureen Gahan from Bord Bia said: "Press Up has the ability to go and purchase buildings, some of which it bought a couple of years ago." Delmar from JLL said while some independent operators are taking up prime space in Dublin city centre, they mostly can't compete for commercial space with groups that can offer key money, which can amount to "multiples of the rent on an annual lease". "If you look at a map, there are only so many units that have restaurant planning permission. There's a view that Dublin City Council is reluctant to grant change-of-use planning, so there is a huge benefit in taking on units that already have planning and refitting them. That's why key money is so important in securing those spaces. "We have seen prime locations like Exchequer Street, George's Street, Dame Street and Temple Bar rent with key money because of their proximity to office accommodation and good night-time trade. The council wants a balance of food and retail." In December, the Jo'Burger restaurant group, which operated premises such as Crackbird and Skinflint, went into liquidation, with businessman Joe Macken blaming higher costs, including rent rises. Independent restaurateurs were struggling to compete with larger groups, he said. This is a sentiment shared by Mitchell, whose Asador restaurant is just across the street from Angelina's, an Italian-style restaurant that Press Up opened in late 2015 on the ground floor of 55 Percy Place, a canal-side block of luxury apartments that McKillen developed with Matt Ryan through their company Oakmount with UK-based U+I. "Labour costs are staggering, and the minimum wage went up at the same time as our Vat bill came in," Mitchell said. "Our customers are property and finance people, but I'm seeing fewer large-scale lunches or celebratory dinners. These guys are holding off on doing deals until they have line of sight of what will happen with Brexit." 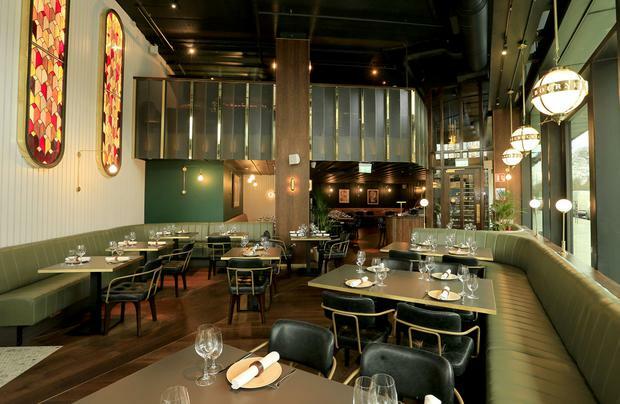 Despite these challenges, Mitchell bought the leasehold on Asador, plans to open a 140-seater restaurant this summer, and has another project lined up for the fourth quarter. "But would I be running looking to spend crazy money on a freehold or leasehold in the middle of town beside a guy who spent €2m on a fit-out? Probably not."